Premium home sites with public water/sewer now available in growing Stafford County, Virginia. Close to Aquia Creek and Multiple Marinas. Build your custom home on this optimal wooded lot in the heart of Stafford County. Total of 5 lots available to choose from. I-95 To Exit 130/Courthouse Road/Stafford. Take Courthouse Road East Towards Route 1. Left On To Route 1 North. Right On To Hope Road To Lot On Left Before Summerwood. Use 379 Hope Road For GPS. 92 +/- acres with potential subdivision up to 9 lots. Wooded parcel with small pond and approx 2,200 feet of road frontage. Ideal location close to Lake Anna Parkway and Spotsylvania Courthouse. Currently no survey or soil work available. Lake Anna Parkway at Cross Road Robert E. Lee. Across from Old Mill Lane. 2.07 acres near the intersection of Enon Road and Jefferson Davis Hwy/Route 1. The property is currently zoned A-1. Located near the Centerpoint Parkway intersection Exit 136 and features phenomenal visibility. Behind Central Park off Fall Hill Ave. Part of Celebrate Vinginia complex featuring Fredericksburg Expo Center. Celebrate Virginia is a 2,400-acre residential and commercial development. Liberty Place is the newest upscale mixed use redevelopment project in Downtown Fredericksburg. This is the most recent of a few redevelopment projects underway that will revitalize one of the most prominent gateways into historic downtown Fredericksburg. The project will also include underground parking and an outdoor courtyard lined with restaurants boutique stores and office. 30,000 +/- SF of office space. This 350 Acre development is anchored by Super Target, Kohl?s, Marshalls, Ross, Dicks Sporting Goods, PetSmart, and other Big Box users; 17 eateries, 5 banks, 3 auto service facilities, and 2 Gas Stations, and 2 pharmacies. Cosners Corner is the Largest Commercial Development in Spotsylvania County with over 972,000 SF of Retail and Office currently in service; 132,000 SF Office; 840,000 + SF Retail. Cosner's Corner is also home to Spotsylvania Regional Medical Center,a 126 Bed, acute care hospital, Poet's Walk, a memory care facility and Station Square, a luxury apartment complex. 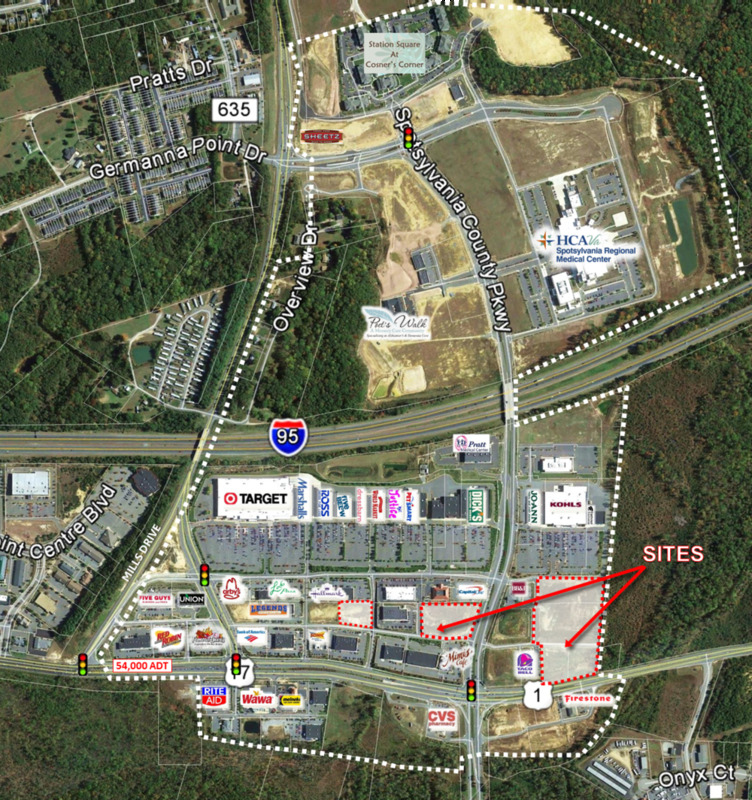 Located in Spotsylvania County, less than 1 mile from exit 126 on I 95 (140,000 ADT). Outstanding visibility with 3/4 mile frontage on Route 1; 1/2 mile frontage on I-95. The development is also located near the new Spotsylvania VRE Station planned to open in 2015. Within 1 mile of Germanna Community College with enrollment over 6,000. Property located at the signalized intersection of Route 3/Plank Rd and Brock Rd. Over 800 feet of frontage on Route 3 with great visibility. Within 3 miles of Lake of the Woods residential subdivision. Approximately 2.8 miles from Fawn Lake and Lake Wilderness. Prime development opportunity in underserved trade area of Spotsylvania.Intersection of Route 3/Plank Road and Brock Road. Great opportunity for medical office, office or retail in Fredericksburg close to Wegmans, Celebrate Virginia & Mary Washington Hospital. Join F'burg Orthopedic & Plastic Surgery Services of F'burg in a park-like setting. Five lots ranging from .61 - 1.64 acres. $300,000 to $750,000. Each lot is separately listed, but may be combined. Once the road work is done on Fall Hill, will have easy access to MWH. I95 South to Exit 130B toward Culpeper. Make immediate left onto Carl D. Silver Parkway. Right onto Fall Hill Avenue. Property on left side of road. Join the tenants of Vinny's, Rita's, Subway and more. Great central location for your business. Unit 10 is over 2600 sq ft can be divided as well. Rent includes water and sewer. Cam is additional $2.50 sq ft and includes trash and lawn care. Rt 3 West to left on Salem Church Rd. Salem Church becomes Leavells Rd after crossing over Harrison Rd. Leavells Sq is across from Battlefield Schools and 1/2 mile from Harrison Road.